WHAT IS A PRAYING MANTID? Praying mantids are among the most distinctive insects, with elongated bodies, triangular heads, and spiny, prey-grabbing "raptorial" front legs (from the Greek word "raptor," meaning "thief"). Mantids are usually a combination of gray, green, or brown, depending on the species. Like grasshoppers and crickets, mantids have thickened front wings (tegmina) which help protect their delicate hind wings. Mantids also have chewing mouthparts. Praying mantids are also called mantises, mantids, and praying mantises. The only insects sometimes confused with praying mantids are the walking sticks (order Phasmida) and the mantidflies (order Neuroptera). Walking sticks, like mantids, are long and thin, but they do not have raptorial front legs. Mantidflies are rare insects (related to lacewings) which resemble small praying mantids. Mantidflies are usually much smaller than true mantids, and the front wings of mantidflies are not thickened and protective like the tegmina of mantids. SIZE: Body length of adult mantids up to 4" long. Nymphs are less than 1/2" upon hatching. Like crickets and grasshoppers, mantids go through a simple metamorphosis, with egg, nymph, and adult stages. The nymphs resemble small, wingless adults. After hatching from eggs in late spring, the predatory nymphs feed and grow through the summer, molting several times before becoming winged, mature adults. In late summer and early fall, female mantids attach large egg masses to twigs. 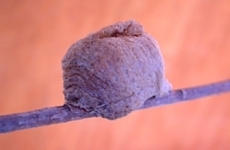 These egg masses often contain hundreds of eggs, and are constructed with a gluey substance that quickly hardens, providing protection from birds and other predators. 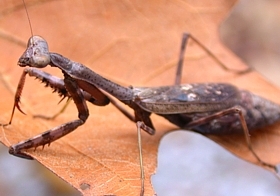 Nymph and adult praying mantids are predators that feed on moths, butterflies, caterpillars, and other insects. Mantids are ambush predators. They are able to blend into foliage with their inconspicuous colors and wait for unsuspecting insects to fly within striking distance of their barbed front legs. Praying mantids do most of their hunting during the day, but are sometimes active at dusk. Preying mantid feeding on a beetle. Praying mantids look tough, but they are not well defended from predators. Despite their protective coloration, praying mantids are often eaten by spiders, birds, and larger praying mantids. Praying mantids do not sting or bite, and are not normally considered pests. However, the Chinese mantid and the European mantid are sometimes considered pests because they are invasive insects, and sometimes feed on native insects, including native praying mantids. The Chinese Mantid, Tendora aridifolia, is the largest praying mantid in Kentucky, reaching 4" in length. Because of its large size, it is one of the most commonly seen mantids as well. Chinese mantids are usually either bright green, tan, or a combination. This mantid was introduced to the U.S. from China in the late 1800's as a potential beneficial insect. It is no longer considered beneficial because it feeds on many desireable native insects, including butterflies and native praying mantids. The Carolina Mantid, Stagmomantis carolina, reaches about 2 1/2" and has a mottled appearance, with gray, white, black, and tan. It is the only mantid native to Kentucky. Not pictured is the European Mantid, Mantis religiosa. The European mantid is typically tan or green and closely resembles the Chinese mantid, but it is smaller on average (2-3"). The European mantid originated in Europe and was accidentally introduced to the U.S. in the 1800's. Praying mantids are common in Kentucky throughout the late spring, summer, and early fall. They can be found in weeds, gardens, shrubs, and in low-laying tree branches in a wide variety of urban, rural, and natural habitats. Because of their "sit-and-wait" hunting strategy and their camouflaged color patterns, praying mantids can be difficult to see. When you find one, though, they are unlikely to fly away and tend to be easy to catch. They will also usually stand still and allow you to get close for a good photograph. Although praying mantids have wings, they are clumsy fliers, and do not take to the air often. Praying mantids are so-called because they appear to be "praying" when their raptorial legs are held at rest. Also: "mantes" is a Greek word meaning "prophet" or "soothsayer." Perhaps the "contemplative" posture of praying mantids reminded ancient people of a prophet at work. Praying mantids have large eyes for a reason: the many facets in their compound eyes allow them to see and capture prey as it flies past. Like praying mantids and mantidflies, ambush bugs (Order Hemiptera, Family Reduviidae) also have raptorial front legs and a sit-and-wait hunting strategy. Despite this similarity, mantids, ambush bugs, and mantidflies are not closely related. 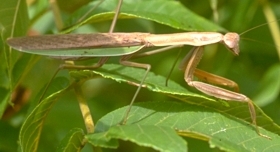 Read more about praying mantids in our Entfact: Praying Mantids. Many people believe that the praying mantid is a beneficial insect. Although it is true that mantids sometimes feed on pest insects, they also feed on other beneficial insects -- including each other. Because of this, mantids usually do not reduce pest populations. 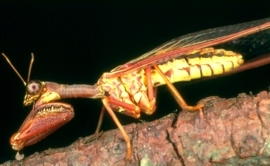 Photos courtesy R. Bessin and B. Newton, University of Kentucky, except Mantidfly, University of Florida; used with permission. The Kentucky Critter Files are maintained by Blake Newton, Department of Entomology, University of Kentucky.